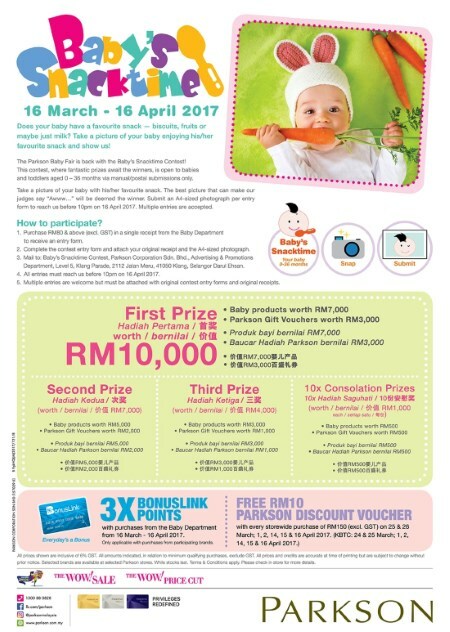 Home » baby » offline contest » Parkson » photo » vouchers » The Parkson Baby Fair "Baby's Snacktime Contest": Up to RM31,000 worth of prizes to be won! The Parkson Baby Fair "Baby's Snacktime Contest": Up to RM31,000 worth of prizes to be won! Purchase RM80 & above (exc. GST) in a single receipt from the Baby Department of Parkson to receive an entry form. Complete the contest entry form and attach your original receipt and the A4-sized photograph showing your baby (aged 0 - 36 months) enjoying his/her favourite snack. Mail to: Baby's Snacktime Contest, Parkson Corporation Sdn. Bhd., Advertising & Promotions Department, Level 5, Klang Parade, 2112 Jalan Meru, 41050 Klang, Selangor Darul Ehsan. All entries must reach us before 10pm on 16 April 2017. Multiple entries are welcome but must be attached with original contest entry forms and original receipts.